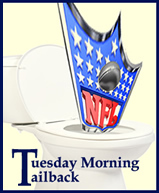 It is hard to believe that Drew Brees seems to once again be slipping under the radar. As one of the league’s most consistent quarterbacks over the past decade and a very recent Super Bowl MVP, it is fascinating that Brees never seems to be mentioned in the top tier of NFL quarterbacks, especially this year which is shaping up to be his finest. Less than halfway through the season, Brees has 18 touchdown passes and leads the league with 2,477 yards, well on his way to his sixth consecutive 4,000 yard season, which will tie an NFL record. This past Sunday Brees threw for 5 TDs with no interceptions as his New Orleans Saints “squeaked by” the Indianapolis Colts 62-7. 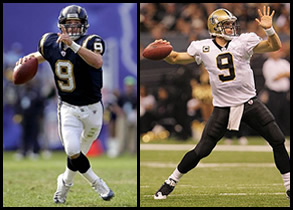 At a mere 6’0″ (short by QB standards), Brees is used to being “overlooked” in spite of his phenomenal accomplishments. At Purdue University he broke all kinds of Big Ten passing records and lead the Boilermakers to their one and only Rose Bowl since the Lyndon Johnson administration. He was drafted by the San Diego Chargers late in the first round in 2001 and struggled to solidify his starting position through his first three seasons, being benched in 2003. The Chargers were ready to give up on him at that point. In the following year’s draft, San Diego aggressively pursued a replacement quarterback, initially drafting Eli Manning and then trading for Phillip Rivers, who they intended to start right away for the 2004 season. But when Rivers held out in training camp, that starting job fell back to Brees and he would not waste this opportunity. Brees would go on to a Pro Bowl season, leading his team from the doldrums to a 12-4 record and a division title. 2005 was equally impressive, however Brees was hurt in the final game and the Chargers used it as an excuse to trade him away. Brees was close to signing with the Miami Dolphins but they decided to sign Dante Culpepper instead at the last moment. Ultimately the New Orleans Saints would be the team to trade for Brees. In his first year with the Saints, Brees helped turn the team around as they went from the team with the worst record in the NFC in 2005 all the way to the NFC Championship in 2006. Still all the “experts” were taken by surprise when Brees and the Saints went all the way three years later. Each year in between, Brees’ numbers, performance, and leadership have consistently stayed in the stratosphere. Right now, aside from Aaron Rodgers, Brees should be considered the top quarterback in the NFL.